Born in Detroit, Michigan, David Goldman made aliyah (immigrated to Israel) with his family in 1975, when he was thirteen years old. After high school he enrolled in a Hesder Yeshiva program, combining mandatory army service with Bible studies, in Kiryat Arba, adjacent to Biblical Hebron. Little did he know how vital Kiryat Arba would become for him. At the time, the community was very small—a handful of families—and the yeshiva itself was housed in a small wooden cabin. And that’s when”, maintains David “my love affair with Israel began.” He hungrily began studying Israel’s history, geography and archeology, focusing on the area of Hebron and Kiryat Arba. And throughout, he felt the need to share his knowledge and his passion with others. He felt privileged to take part in the exciting archeological dig at the Ancient Synagogue of the Southern Hebron Hills, uncovering remnants from an era he could only read and dream about. Five years ago David was approached with an offer to open an educational outreach program, and in 2001, in the presence of President Moshe Katzav, The Land of Judea Museum in Kiryat Arba-Hebron, opened its doors. “I’m thrilled to be able to show the children of Israel that the words of the Scriptures are alive! 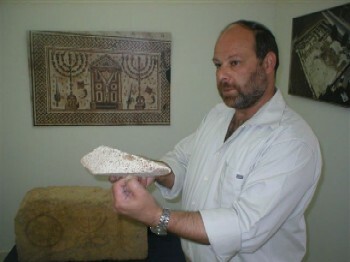 With the ancient artifacts in my hands I can do far more than tell them the Biblical stories—I can show them!” A piece of pottery from the Tomb of the Patriarch… an earthen remnant from the reign of King David gives substance, reality, to Israel’s written history. David also feels that the museum serves a political purpose. In the peace treaty with Egypt, too many archaeological riches were transferred to the Egyptians. Since the Oslo Accords, David feels an obligation to future generations that the communities and all their artifacts remain in the hands of the Jewish people. “They must never be given to the Palestinians,” he exclaims. David remembers being a young man in yeshiva, during a time of countless acts of terror. It was a turning point in his life. He knew then, that nothing has ever broken or will ever break his people, nor take this Land of the Patriarchs away from them. David and Batya have imparted their pioneering spirit to their children. Their son is married and lives in the Samarian town of Eli with his two children. One married daughter lives with her three children in Yerucham, part of a nucleus of young religious families who are bringing Biblical values and spirituality to this poor development town. His youngest daughter is doing her National Service there, in Yerucham, teaching Bible to underprivileged children. And another married daughter and mother of one, lives near him, in Kiryat Arba.